Due to traveling & such,we haven't entered the Royal Foodie Joust in a couple of months but we were very inspired by this month's ingredients; apple, maple syrup & cayenne pepper. We had a lot of ideas for pies & donuts but then we heard about the Apple Bliss Blucy at the Blue Door Pub in St. Paul. The Blue Door does some really interesting takes on the classic Minneapolis Juicy Lucy & this version stuffed with brie & topped with apple compote was only available for one day. We couldn't make it there that day so decided to put our own spin on it at home. In our version the beef is flavored with a little maple syrup & then stuffed with brie. The apple compote is spiced up with cayenne, sweetened with maple syrup plus given a little saltiness with some bacon. Put it all together & you really have an amazing flavor combination. The apples go surprisingly well with the beef. We'd never stuffed a burger with brie before & it tended to leak out a lot more than others we've tried. It infuses the beef with the flavor but isn't overwhelming. If you want the brie flavor to stand out a little more just put slices of it on top of the cooked burger & then top with compote. We also think cheddar cheese would be fabulous with this flavor combination instead of the brie. Cook bacon until crisp. Drain on a paper towel. Set aside. Place all ingredients, except bacon, in a small saucepan over medium-high heat. Cook, stirring frequently, until the apples are soft & most of the liquid is gone. Mash with a potato masher or spoon. Stir in bacon. 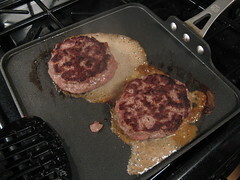 Mix the beef, maple syrup & salt & pepper to taste together with your hands, do not over work. 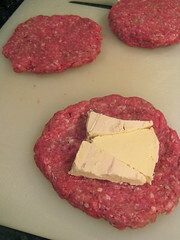 Divide into 4 equal pieces & make into patties. Cut the brie into slices, removing the rind if you wish. Place the brie slices on the middle of two patties. Top with the other two patties. Press the edges together to seal. 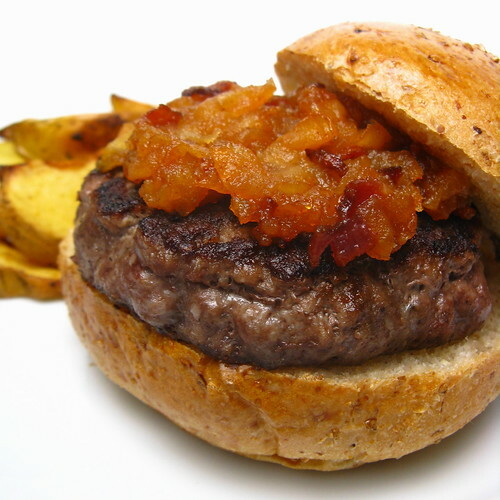 Top the burgers with the spicy apple bacon compote & serve on a multi-grain bun. Thanks to Natasha at 5 Star Foodie for choosing this month's Foodie Joust ingredients & to Jenn The Left Over Queen for hosting. Ok I have no clue why I never thought of double patties. 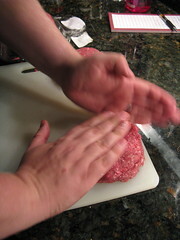 When I stuff burgers I just form a big ball of meat and shove the cheese in the middle of the ball and flatten around. Grr....almost seems to easy now. I am loving this time of year with all the fresh apples. Nicely done! This is one beautiful burger! Oh wow. This looks really good... I'm betting the brie with the bacon and apples is just fabulous. It is great to have you back in the Joust, thanks so much for joining us again! Definitely blown away by this one! Apple Bacon Compote? Oh wow, that sounds amazing! My mom used to always make Greek burgers filled with cheddar cheese and garlic powder. That is no where close to being Greek (at least as far as I know) so I have no idea how they got the name. Ha, ha! They were good though and I would imagine even better with brie! it was a stroke of genius to combine these flavors into a burger! the sweet and savory and salty aspects must work together like magic--delightfully done! Your creative twist to the hamburger is sensational. I am definitely going to try your apple-bacon compote. Well done! I saw this on the Foodie Blogroll forum and just had to come over and say...YUM! Love the spicy apple bacon compote. I need to make some stuffed burgers. My last attempt was with blue cheese in the burger. I had a little bit of an oozing problem. You and Matt seem to have this technique totally down pat. This is so unbelievably creative! I love anything and everything maple. 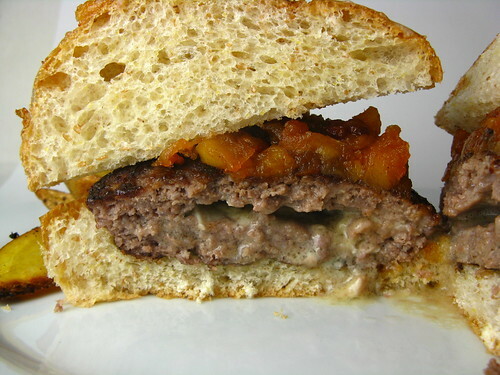 I love stuffing burgers with cheese, it keeps the burgers nice and moist. Freezing your cheese for about an hour before you cook the burgers will help to keep the oozing at bay. Kat, that's one freakin' good looking burger and the choice of bun is important too! I meant to comment on these the other day--I left the window opened, but some kid closed my tabs, grrr. These look freaking incredible! I've said it before, but it bears repeating: I LOVE your flavor combos! Oh wow! That looks so good! Fantastic use of ingredients. This looks amazing! I've been in Minneapolis for 5 years and I still haven't had a Jucy Lucy - I think I'd rather start with your version. Congratulations on the Royal Foodie Joust win! Congrats on the win, this is a great recipe. Can't wait to wow my guests with this one.